(kon -ik) (conics) A family of curves that are the locus of a point that moves so that its distance from a fixed point (the focus) is a constant fraction of its distance from a fixed line (the directrix). The fraction, e , is the eccentricity of the conic. The value of the eccentricity determines the form of the conic. If e is less than 1 the conic is an ellipse. A circle is a special case of this with e = 0. If e = 1 the conic is a parabola and if e exceeds 1 the conic is a hyperbola. These curves are known as conic sections because they can be obtained by taking sections of a right circular cone at different angles: a horizontal section gives a circle, an inclined one an ellipse, one parallel to the slope of the cone is a parabola, and one with an even greater inclination is a hyperbola (see illustration). Conics are important in astronomy since they represent the paths of bodies that move in a gravitational field. See also orbit. Circle, ellipse, parabola, and hyperbola; all produced by cutting a plane through a cone at different angles. The teaching of conic sections in schools  and the investigation of problems that are connected with conic sections in journals that deal with school mathematics [8, 15] has posed a problem about modernizing the way that they are taught in school and university. 7 Conic sections cannot be plotted directly with many dynamic geometry software packages, and a conic section only appears as the locus of some point. Eight pages of "quickies" are followed by 26 pages of more complex problems in the areas of combinatorics and number theory, functions and polynomials, expression and identities, numerical approximation, algebraic inequalities, trigonometric inequalities, geometric inequalities, the triangle, Cevian lines, central symmetry, conic sections, solid geometry, higher dimensions, vectors and matrices, and calculus. 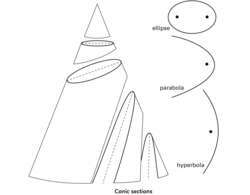 A wondrous fact about conic sections is that most properties have taxonomic significance; that is, there is an intrinsic symmetry between the ellipse, the parabola and the hyperbola. Abu Ja'far Al-Khazen (c 960), a native of Khorasan, Persian, as Omar Khayyam tells, solved the equation by the aid of conic sections (Smith, 1958). The chapters include a review of basic algebra, systems of equations, rational expressions and equations, exponential and logarithmic functions, and conic sections with more graphing. The fifth edition adds optional sections on parametric graphing, arc length, and parametric equations for conic sections. One may also use this article as a different technique for reduction of conic sections to the standard forms. A final section considers conflict lines and reflections regarding edge and conflict; parabola, ellipse, and hyperbola; analytic geometry; and conic sections. The topics include equations and inequalities in one and two variables, exponents and polynomials, rational expressions and rational functions, quadratic functions, and conic sections. They start with real numbers and their basic properties, then turn to equations and inequalities, graphing and solving systems of equations and inequalities, polynomials, factoring polynomials, proportions and rational expressions, writing equations of lines along with functions and variations, radicals and rational exponents, quadratic functions, inequalities, algebra of functions, exponential and logarithmic functions, conic sections and a set of miscellaneous topics such as geometric sequences. Coverage progresses from inequalities and graphs, through various types of functions, conic sections, polar coordinates, systems of equations and inequalities, and sequences and series.